Simon Siggs grew up riding motorcycles in downtown London. 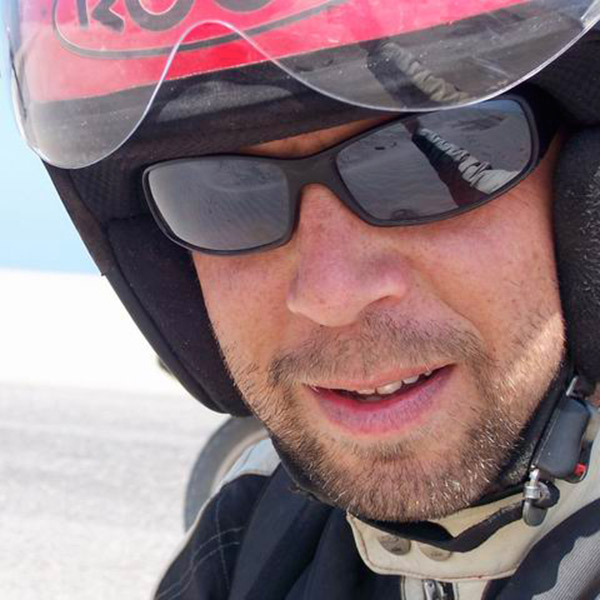 On a whim, he joined an Alaska Rider motorcycle tour one summer. Since then, he has never been the same. All he can consciously think about is his next motorcycle adventure. Since the Alaska trip, Simon has ridden extensively in Great Britain, South Africa and Alaska again. He has also ridden solo from Prudhoe Bay to Ushuaia, Tierra del Fuego. During that ride, he raised money and awareness for Fragile X Syndrome. Simon is one of the funniest, most optimistic people you will ever meet. He always has something interesting to say, and usually it leaves you in stitches! Favorite Motorcycle Experience: My first tour of Alaska with AK Rider. It opened me up to motorcycle adventure. Expertise: He has no training in anything.... but does seem to have an ability mime well, when trying to communicate. Just following his handlebars is the only experience really , oh, and sniffing out good local beers !